Well, who doesn’t love rain? Like us our furry buddies too love rain. The wet grounds, smell of soil, moist grass, colourful umbrellas, short walks. But they need a little more care during this season as they are very sensitive to loud noise, prone to tick and flea attack and skin infections. So, let’s go step by step. Make sure the house is mopped every day. Pet’s bed is clean and dry, if little moist or damp blow dry it. Keep the bed in the sun for 15- 20 minutes every day. Wash the food and water bowl regularly. Have a first aid kit for pets and vet’s number handy. Feeding the pet right food and quantity is very essential. It depends upon the level of pet activities. 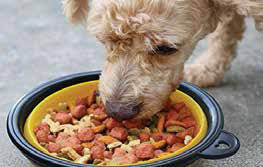 Feed the right quantity and have a tab, so that you don’t end up overfeeding the pet: adults 2-3 meals a day (breed, size and weight), puppy 5-6 meals a day. For healthy digestion and bowel moment provide your pet with fibre rich meals. Wash the water bowl daily and place it in cool n dry place. 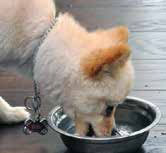 Provide boiled water as it will prevent the pet from stomach infection. Due to rain we intend to cut short on walks for pet. Totally fine but you need to compensate it with indulging in indoor activities. Pets also like to have fixed time for everything. It’s good to have a discipline pet. Make one fixed time for food, walks, other indoor activity, mention if medication has to be given, quantity, etc. So, if you aren’t around someone can still keep the pet up in routine. Our pets are very sensitive to loud noise, this can cause anxiety, fear, aggression and fear leading to stress in pet. Pets tend to hide in dark small places, comfort them by hugging them, talking to them, belly rubs do help. At nights keep the bedroom door open or place the pet’s bed at a corner of the room from where he can see and feel comfortable and safe. Check if the vaccines are up-to date, as it helps to fight many diseases. Deworming has to be done thrice a year. It helps in immunisation. We would have noticed the paws are always moist. That’s due to sweat from paw pads. Sometimes due to furry buddies licking it or most of the time after long walks. Wash the paws after walking your furry friend, thoroughly with warm water, add antiseptic solution. Pat it dry with soft towel and blow dry it. This will prevent the pet from catching any skin infection or breeding of tick and flea in between the paws. Well, it’s quite common for pet to prone to tick and flea and skin infections due to moist coat. Keep the pet clean and dry. Check the skin regularly, notice the redness or change in skin colour, follow up with your vet. Use flea comb to brush the pet. Clean the ears every week or use cotton balls during the bath, so that the skin is not damp or wet. Due to climatic change many insects and parasites come in touch with your pet. Keep anti-allergic tablets, antiseptic solution, bandage, surgical powder, pain killer, Digyton and Immunol syrups. And also have anti-venom for scorpion sting or snake bite if you stay near countryside. Write the vet’s number on the box in case of emergency and always in your mobile phone. Also make a note if the pet is suffering from any kind of illness, heart disease, kidney problem, etc. Every twenty days or as needed. Use warm water and right shampoo. Brush the coat before and after bath. Clean the ears and teeth. Clip the nails, if required. Blow dry the pet without fail. Keep the pet indoor and safe. Check the water bowl before you leave. Wash the paws after walking the pet. Pat them dry. Brush the pet twice a day using flea comb in opposite direction, which means from tail to head. Check the collar for dampness. Give a sponge bath or wet wipe down with towel, if the pet gets wet in rain. Ensure your pet is dry. Taking help from professionals or having a doggy day out in spa would be great. It’s not just cleaning them that’s important, doing that in the right way is also equally important. With one wrong move you might end up hurting your pet or yourself. Everything is available online but always get your pet checked from vet or take help from professionals. Because every remedy is not going to work on every pet as all pet needs are different.